The campaign organisers in Canada and the EU tweeted that they lost contact with all journalists onboad and suspect that the Israeli navy jammed the boats' communications. "At 10:58 am (Irish time) we received an urgent call from Dr. Fintan Lane, National Coordinator of Irish Ship to Gaza aboard the MV Saoirse, to say that two Israeli ships are rapidly approaching the Irish and Canadian boats. 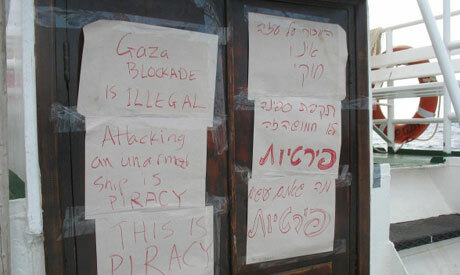 The MV Saoirse and Tahrir are 48 nautical miles from Gaza’s shores," said the statement. "We will keep coming and coming until the blockade of Gaza is lifted" campaign organisers said on the Tahrir boat Twitter page. They added that Israel has no rights to control any Palestinian sea, land or air. They called on the Canadian government to "protect the ship instead of protecting Israeli brutal policies against aid ships." Between the two boats, they carry 27 passengers and some $30,000 worth of medical aid, as well as journalists and crew members, said organisers. The ships left a port in southern Turkey on Wednesday and were expected to reach Gaza by Friday morning. These so called helpers of Hamas have been hiding under a rock and only interested in making headlines for themselves.Israel has every right to protect itself and the blockade is legimate as it has been approved by the UN.There is no hardship in Gaza.These so called activists should go there and have a look.Take the medicines overland as Israel suggests you morons.Please just give up as you will never defeat Israel.Shalom.